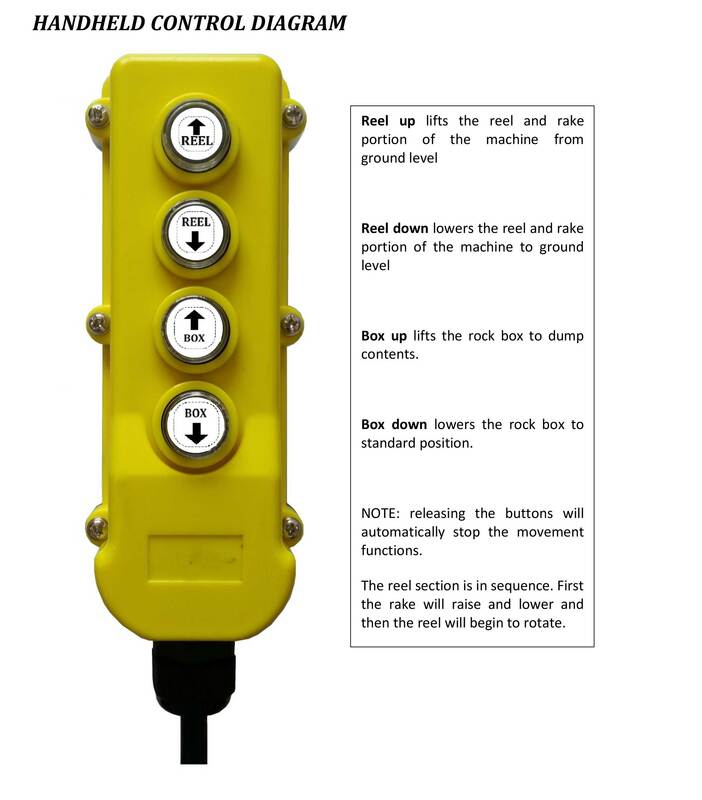 The Marshall Rock Rock Picker is easy to use and with care and attention will provide years of service to you and your farm. You’ll love the responsiveness of the Marshall Picker, speed and power to haul rocks season to season. Expect to see an increase of 50% productivity on your farm! Watch a video of the Marshall Picker here and get to know the Marshall Picker through our Tips below. Farm work is tough and safety is on the top of the list. Good safety practices protect you, but also the people around you. This applies to machinery, from assembly to use. Remember, most accidents can be prevented with simple steps to practice safety. if this machine is used by an employee or loaned or rented to others, it’s important that you and any other operator is clearly instructed in safe and proper use of the Marshall Picker. Have them review our manual. NEVER make any adjustments, lubricate or perform any service on the machine while it is in operation. Do not overfill rock box. Fill only to the capacity your ATV/UTV can handle. Protective clothing and equipment should be worn. Wear clothing and equipment appropriate for the job. Avoid loose fitting clothes. Learn more about Farm Safety from Successful Farming. Read the operator’s manual for the ATV/UTV to become totally familiar with the controls and instruments. Know how to stop all equipment operation in case of emergency. Review the Handheld Control diagram and you’ll see how easy the controls are to use. Before operating your Marshall Picker you’ll want to take time to check your connections. After receiving your Marshall Picker, take time to double check the entire machine so that all bolts are securely tightened. Recheck after 2 and 8 hours of operation. Make sure all grease fittings are in place and greased properly. 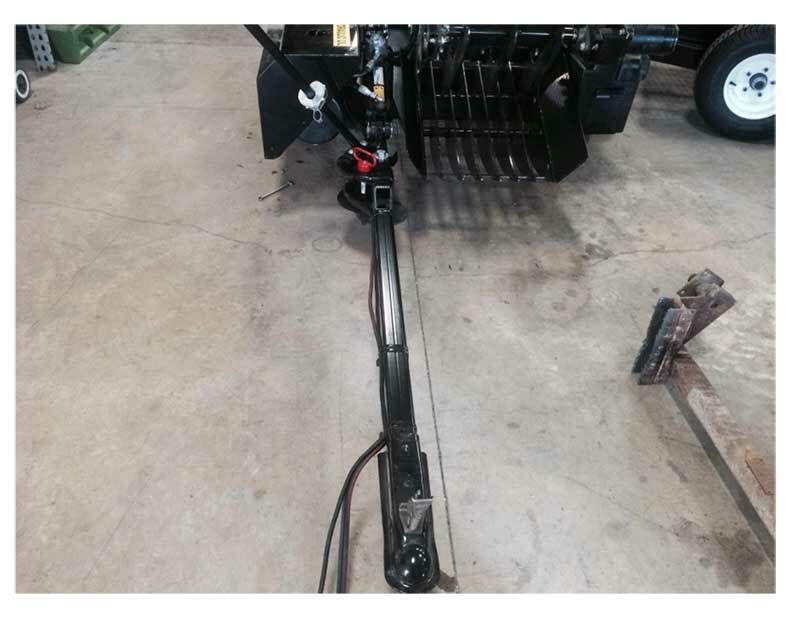 Take time once the machine is hooked to the ATV/UTV to assure the hitch is securely fastened and the cord from the handheld pendent is not dragging the ground. Some Marshall Pickers may arrive needing the hitch bar and wheels to be assembled to the main unit. When you purchase a Marshall Picker we’ll talk to you about the equipment you’re attaching the Picker to and we’ll have talk about the ATV/UTV hookup you’re using, and we’ll talk about the weight and power of your gear. Marshall Picker. Customer will be responsible for hooking up the ATV/UTV end of the 12v supply. Only the ATV/UTV connector end is provided. All wiring should be installed by your ATV/UTV dealer. 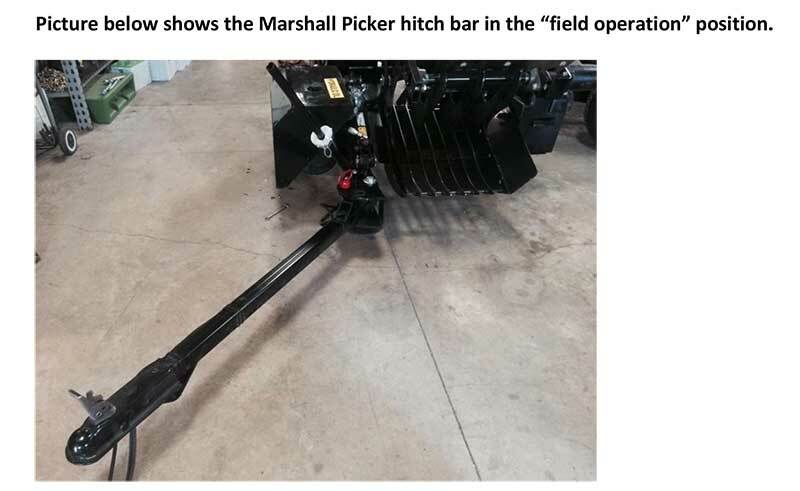 Photo below shows the Marshall Picker hitch bar in the “transportation” position. Used when moving on roadways or loading.